I enjoyed this tale mostly because of the sheer uniqueness of the heroine and her determination to solve an attempted murder mystery. What made this novel so intriguing was not just that fact that she’s nineteen years of age, but that she had to do it amongst the strictures of the times. She’s of noble blood and there are certain things a lady simply cannot do in that day and age. Somehow, the author managed to weave just the right amount of respect for her betters, her mother and the advisors with her tendency to investigate things in her own way. I was able to get a sense of how frustrating it must have been for Caroline to want to know something and being told nothing because back then, women had to be protected from every unseemly act or perceived upsetting information. Caroline refused to be a swooning damsel in distress and sought to prove it at every turn. I’m surprised the hero didn’t end up with gray hair by the end of the book – she was that adventurous. The tale is mostly told from Caroline’s point of view because she was the one everyone seemed to want to kill. That others died instead, some rather brutally, could not be helped. One thing is for sure – the heroine is intrepid, practically fearless and thinks quick on her feet. It’s a good thing too. Let’s just say that trees are her friends and play various roles in the telling of the story. 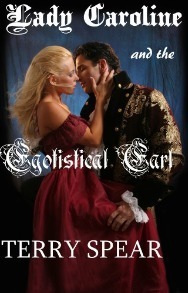 Her internal dialogue is how a reader follows her growing attraction to the egotistical earl. For all John’s heroic tendencies, he does come off rather pale in comparison to Caroline. She is a hard act to follow but he stands by her for the most part. The fact that a man must behave in a certain way and is expected to, especially a man in his position, annoyed John to no end because he wanted to throw caution to the wind and act on his impulses. But being an earl, a man of power and well respected, he had to act as decorum dictated. I enjoyed the little moments when he rebelled just that little bit because it made him seem less stiff and more like a man falling in love. The villains of the piece were more like nipping dogs. They caused no end of grief, they couldn’t be caught and the leader of the pack sent his mercenary to do the dirty work. It was interesting to note that Caroline liked to think out of the box, and her doing so propelled the plot onwards to some exciting, if unconventional, adventures. Secondary characters were many but a few were central to the plot and they played their roles well. The funniest item in the book was the box. That caused me no end of amusement. The hero on the other hand found it quite vexing. I thought the author clever for adding that in. Lady Caroline and the Egotistical Earl was vastly entertaining. It might seem to go on a bit longer than perhaps it needed to be but there is no doubt that I enjoyed myself. At one point I just rolled my eyes at Caroline’s antics and thought to myself, ‘not again!’, but I found how all the characters reacted to her incredibly amusing. If this had been a Regency romance, I’d classify Caroline as a true “Original”. The heroine was a hoot and I liked her. The happy ever after wrap up occurred at supersonic speed, but after the mayhem they both survived, it’s perfectly understandable. This isn’t a fast read so make sure you have plenty of time set aside to enjoy Lady Caroline and the Egotistical Earl. It’s worth it.